So yesterday I found some cut-outs online to make parabolic reflectors from. The idea was to put them on the antennae on my router and redirect some signal toward the rest of my house, instead of through my wall to people across the street. My niece cut them out, put aluminum foil on them, and taped them together. She did a very good job for a kindergartener, and was very excited to see the differences in the signal strength. Call me Bill Nye. Some of the really low drop outs were from people getting in the way a lot after I started testing stuff, moving around to see how it would affect the signal. 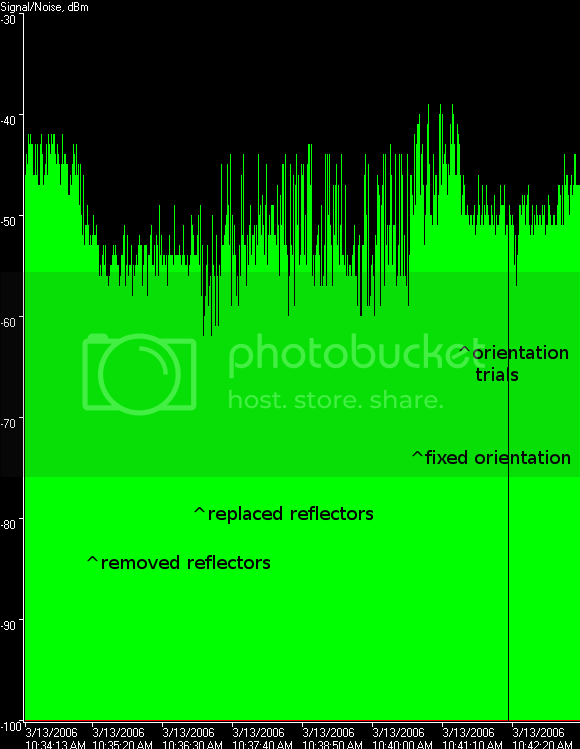 The picture is some test data with and without the reflectors to show the difference. I started with the reflectors in place. There is a definite difference between using them and not, and they cost approximately 10 cents to build. Not bad for a 10-15 dB improvement! This test was run about 50' from the router through 2 walls. Laptop orientation matters because of the relative positioning of the internal antennae. The program I used to get the signal data is NetStumbler, which is free.